Your laboratory space is valuable. Logistics can help you manage your freezer storage by relocating your long-term specimens to our facility at Oyster Point in South San Francisco. 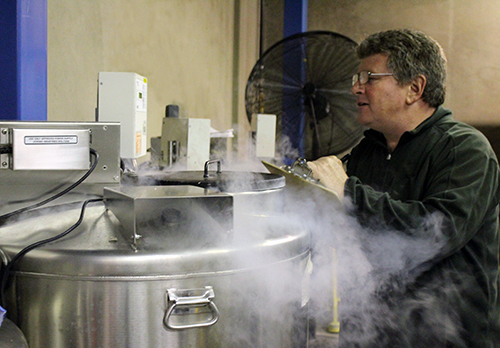 Our warehouse can house customers’ ultra-low mechanical freezers and vapor-phase liquid nitrogen freezers. Our staff takes a reading of each freezer, twice a day, to make sure there is no sudden fluctuation in the freezer’s temperature. In case of such an occurrence, customers are contacted immediately. Ambient room temperature readings are recorded to monitor consistency in the environment. Logistics also has six -80 degree backup freezers available. Customer specimens can be moved into these backup freezers should their own freezer fail and require repair. To learn more about our freezer farm, including specialized storage capabilities, access to the facility, the backup power plan, freezer specifications, fees and more, please contact us at (415) 502-6245 or [email protected]. Or check out our BIo-Specimen Freezer Storage Frequently Asked Questions.